So, you have an idea for a website. It’ll be the best website on the whole internet, and you’ll be selling only the best services and products possible. Once customers arrive at your homepage, they’re going to jump for joy practically. All that’s left to do is build the website, register the domain and you’re good to go! 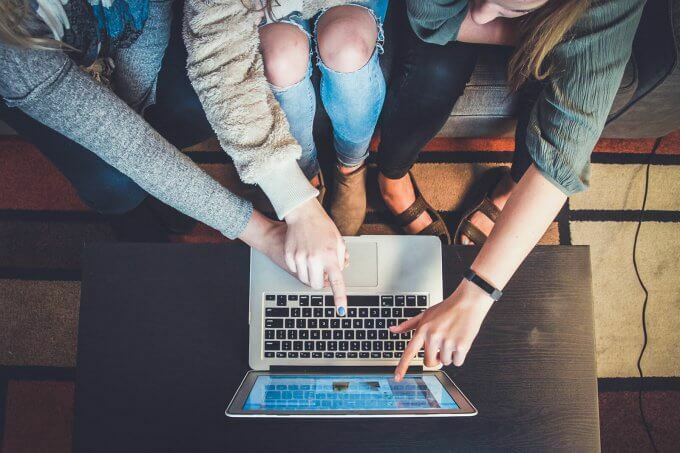 Whether you have a domain name in mind already or you’re just planning to wing it, choosing a domain name is one thing—finding one that’s actually available is entirely different. There are millions of websites on the Internet, and unfortunately, many of the best domain names are already taken either by legitimate businesses or squatters willing to sell to the highest bidder. 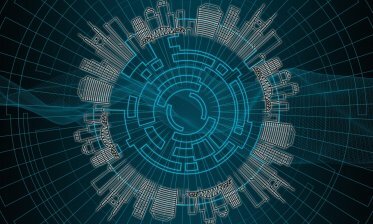 Your best bet to secure an available domain name is to come up with something wholly original and unique or purchase the name from the domain holder. 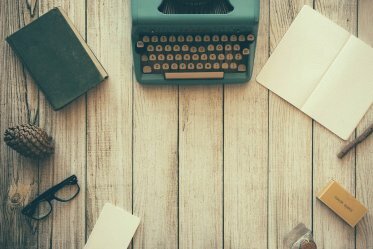 Brainstorming unique domain names can be difficult, but we’re here to help. In this expanded domain name guide, we’ll cover the basics of a domain name, what domain name generators are and how they work, and our list of the top 15 best domain name generators on the web. You may be wondering if domain names are really worth all of the effort. It’s just the web address, it isn’t that important, right? In reality, domain names are incredibly vital to your website’s success. Domain names are essentially an extension of your brand and could potentially make or break your online presence. When people are browsing online, more times than not the domain name of the website is what convinces them to click through to the site. You want your domain name to be unique, descriptive, and in tune with your existing brand. In case you weren’t aware, a domain name is the web address users will search to find your website. Like mentioned earlier, there are millions of web pages on the Internet, and each day, thousands of new domain names are registered by users around the world. We’ve covered domain registration in the past so today we’ll focus on the names themselves. A domain name is comprised of at least two parts: the actual name and the Top Level Domain (TLD) extension. So basically, when looking at Google.com, “Google” is the name and “.com” is the TLD. Easy enough to understand, right? While “.com” is the TLD that you are probably most familiar with, there are other TLDs that website owners use such as “.me,” “.net,” and “.us” to set themselves apart and to provide a distinction for the type of website they run. Originally, .com was meant for commercial businesses while other TLDs such as “.org” indicated the website was a non-profit organization. These days as the Internet has advanced and with more domains registered, the rules for the use of these TLDs are a little more relaxed with new TLDs gaining popularity. Now you can use the TLD “.social” for your social blog, or “.us” to indicate your business is located in the U.S. The possibilities are endless and if you use these TLDs creatively, you might end up with a memorable domain name that your customers won’t soon forget. 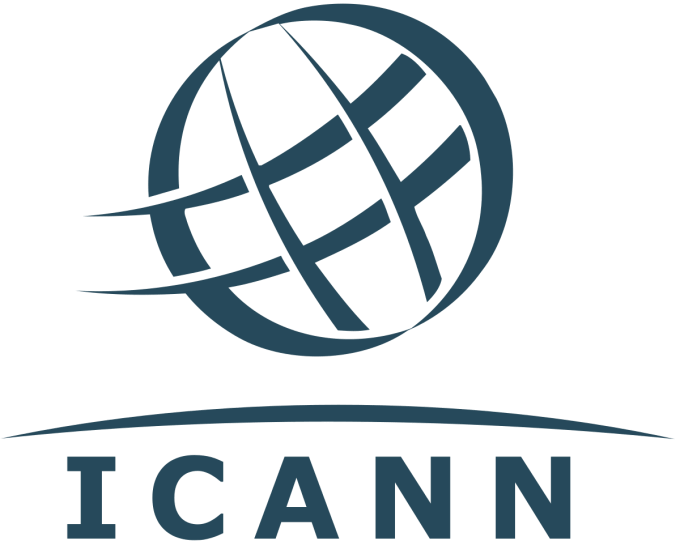 Domains are under the jurisdiction of the Internet Corporation for Assigned Names and Numbers (ICANN for short) which is the organization responsible for establishing new domains along with maintaining them as well. 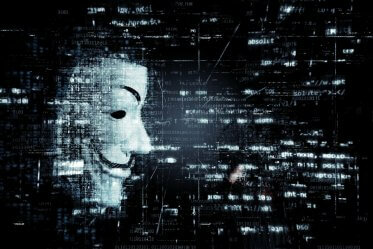 You can register any domain you want, but without approval from ICANN, it won’t be visible to anyone else on the web. When you have your domain name in hand and go to a famous domain registrar, they’ll store the domain on their servers, but they will also coordinate with ICANN to ensure that the website is visible and accessible to everyone online. Are There Domain Name Rules? Domain name registration periods can’t exceed ten years, meaning they must be renewed periodically. Domain names can be declined if they are deemed offensive. When registering your new domain name, your particular domain registrar will be able to instantly recognize if your chosen domain name breaks any rules or traditions to ensure you don’t experience any future problems with your website. 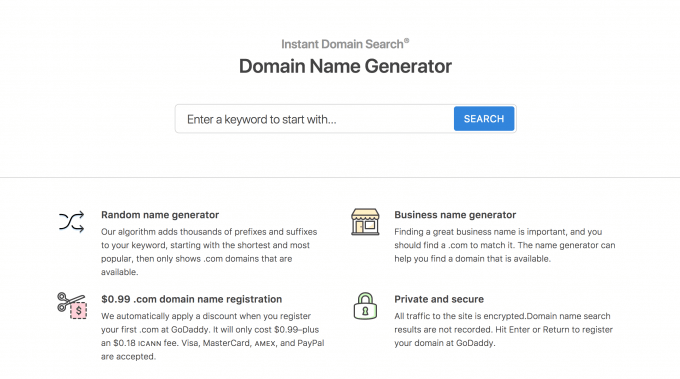 What is a Domain Name Generator? A domain name generator is a website that allows users to enter a search query and the aggregator will then check the web for available domains and offer suggestions based on the keywords. While many domain generators provide the same essential services of checking for possible domain names, others will provide advanced tools and even help in the brainstorming process by suggesting additional keywords to use. 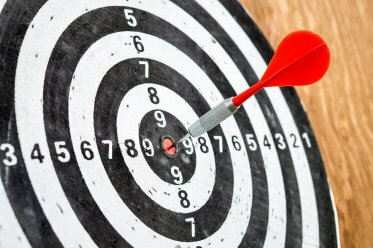 While it is possible to get lucky and come up with a unique domain name off of the top of your head (usually if it’s a company with a unique, 21st-century sounding name), most of the time many of the domain name ideas you may have were taken long ago. Whether the domain name actually belongs to a legitimate business or merely a squatter waiting for the highest offer, influential, easily-identifiable domain names are harder than ever to find. Domain name generators utilize tools that scan and check the domain registry at lightning fast speeds based on different search queries. Much like a regular search engine, once you input specific keywords into the domain name generator, its algorithms and AI technology will check the domain registrar to find all available matches. Depending on the capabilities of the domain name generator, you can set specific criteria for the search, and it can also provide suggestions based on the keywords you chose. Domain name generators aren’t perfect. 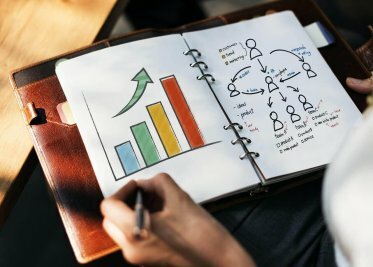 Because they are mostly based on computer algorithms and AI, there are bound to be some mistakes, and you will need to do a little strategic thinking when selecting your domain name. Domain name generators are extremely useful in your search for the perfect domain name, and they are bound to bring some inspiration to get your creative juices flowing. Now that we’ve covered the basics let’s get to our hand-selected list of domain name generators. For more information on the keywords that you’re using to find the best domain name, Instant Domain Search will provide users with detailed analytics to help them decide if they are using the right keywords when choosing their domain name. Also, Instant Domain Search has a sleek user interface which makes searching and viewing domain name suggestions even easier. Besides showing which domains are available, Instant Domain Search will also display the prices and purchase information for the possible domain names it suggests. No longer will you have to track down the domain holder as Instant Domain Search will provide an easy-to-follow link to get you there. From Automattic (the team behind WordPress), Lean Domain Search brings users a plethora of .com domain name suggestions and shows the status of any domain you search. This is a super handy tool when you quickly want to see which domain names are still available and which are taken. Also, thanks to the convenient color codes that each domain result displays, you can see at a glance which domains are up for the taking and which are spoken for. You can also favorite specific domain names that you might be interested in the future and then follow along over time to see if they become available for sale. Lean Domain Search is precisely as the name describes: a lean domain search tool without any bells and whistles but a robust set of core tools. While some domain name generators require users to tweak different advanced settings to get domain names that are even remotely promising, Name Mesh is super easy for anyone, even beginners, to use. To get started, all you have to do is enter in two or three keywords you are interested in, and the generator will produce a list of available domain names. Additionally, each of the domain names it produces is categorized under tags such as new, common, short, similar, and fun to help you make a better decision for the impression you’d like your domain to give to future website visitors. Many online entrepreneurs are skeptical of using online name generators because they fear that these sites record search data. This skepticism isn’t misplaced and something that you should keep in mind as you go through the domain search process. While all of the generators on this list are trustworthy, there are some less than honest sites out there that record search data, buy domains using popular keywords, and then resell the domains to make a quick buck. With NameSmith you have nothing to worry about. They offer a promise that none of the search data will be shared with other services or sold to anyone, ensuring that your keyword searches are safe and should you decide not to jump on a domain at the time, they won’t steal it immediately afterward for their own gain. Domainr is jam-packed with advanced tools and features yet still retains an extremely user-friendly interface. This is a huge benefit over other domain name generators online because most seem to confuse “advanced features” with cluttered interfaces. On Domainr, users merely search the keywords they are interested in, and Domainr will return all of the available domain name results. Another cool feature of Domainr is its inclusion of premium TLDs. For instance, if you were to search for “scorpio,” Domainr would include premium domain names such as “scorp.io” in its list of results. 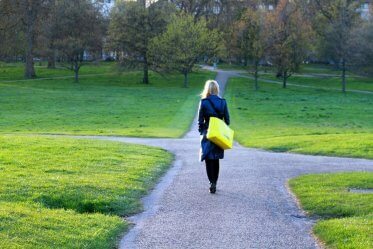 This gives users more options and ideas for choosing the perfect domain name. 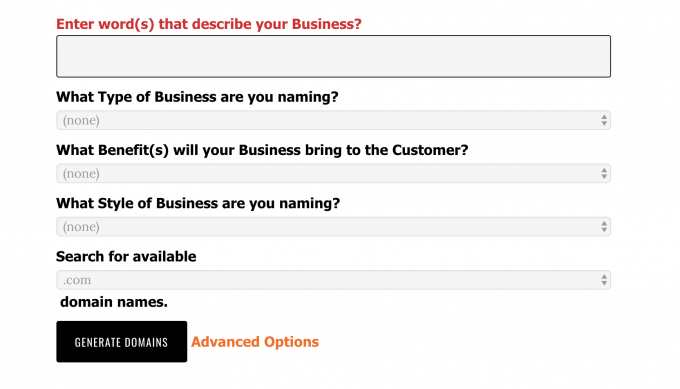 If you are using the Shopify platform for your e-commerce store or plan to once you have a domain name, you might want to consider Shopify’s built-in Business Name Generator. It offers the essential tools necessary to find a unique, memorable domain name all wrapped into a convenient user interface. They claim that you can find a new, unique brand name in only 10 seconds which is ultra-fast as far as domain name generators are concerned. This generator leans more towards businesses that utilize the Shopify API and will offer suggestions based on the aggregator’s experience with past Shopify stores. If simplicity and ease of use are top priorities for you and your business, we highly recommend this choice. As the name suggests, PickyDomains is for those looking for more than a domain name, but a call to action that will engage website visitors. PickyDomains is different than every other domain name generator on this list because it isn’t based on AI or algorithms but instead human contributors. All you need to do is sign up, create a domain name request that describes what you are looking for. Then, you just sit back and wait for suggestions to come to you! Their community is made up of 70,000 domain name experts from more than 160 countries which allows for a wide variety of ideas from around the world. Once you’ve found the domain name you like the best, simply accept it, pay $50 for their services, and you’re good to go! If you are in the brainstorming mood, dnFellow gives you the opportunity to see a variety of different name ideas! Users simply select their desired TLD, enter their main keyword in box one and the other keywords in boxes two and three, and then hit search. If you’re not sure of the keywords, you’re interested in, that’s no problem at all either! dnFellow offers keyword suggests based on predetermined themes and categories. If you wanted to start a blog reviewing the hottest new country albums, all you would have to do is select the blog category and then choose music from there. 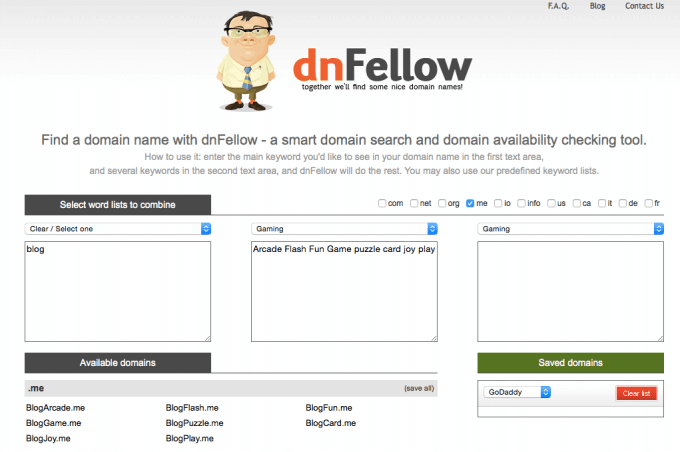 dnFellow will then generate a list of domain name suggestions for you to pick from. If you like the idea of a generator interviewing you to find the perfect domain name that describes your business, Cool Names Ideas may be the choice for you. The tool asks users a list of questions about the purpose of the website; the benefits customers will derive from the website; what style of business you run, and more. After you complete the list of questions, you will be guided to a results screen which lists the available domain name suggestions that the AI determines is a good fit for your prospective website. What makes this domain name generator different is that it is actually controlled by a panda working in a domain name factory to bring users the best results. We’re just kidding on the panda part, but Panabee is a great tool for users that just want to enter a string of keywords and have a large variety of domain name suggestions delivered to them automatically. One of the best features of Panabee is that if the domain name is taken, it will provide suggestions based on your original idea with variations in syllables, abbreviations, prefixes and suffixes, and other popular domain trends. Bust a Name isn’t the prettiest domain name generator, but it provides a significant number of domain name results that you can’t find elsewhere. Bust a Name is a tool designed with advanced users in mind which is why many high-level settings are integrated directly into the UI. In addition to standard features, with Bust a Name, users can set specific prefixes, suffixes, hyphens, and many more advanced preferences. This allows for specific domain name suggestions, helping you narrow your choice down even further. 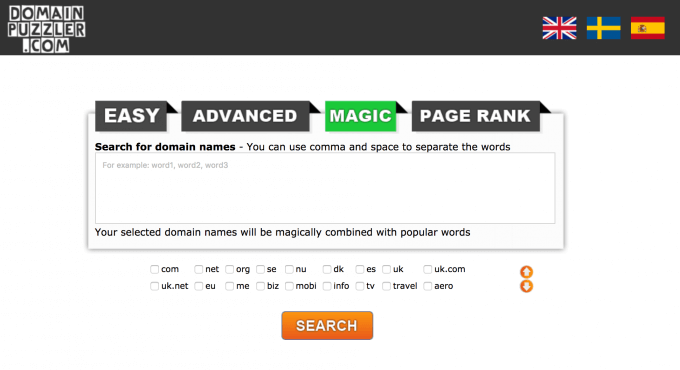 NameStall is the ultimate domain name suggestion tool. It allows users to simply enter their keywords and then select from 180 different word groups to pair their keywords with. The categories are intuitive including Common Smart Misspells and 1500 Popular Last Words. For inspiration when deciding on a domain name, the Domain Name Suggestions tool will help by generating a list of two-word domain names using your input keyword. NameStall offers unique tools that you really can’t find anywhere else; for instance, if you wanted only to list five-letter words starting with “x” you can via the Dictionary Word Domain Search tool. The possibilities are endless with NameStall. 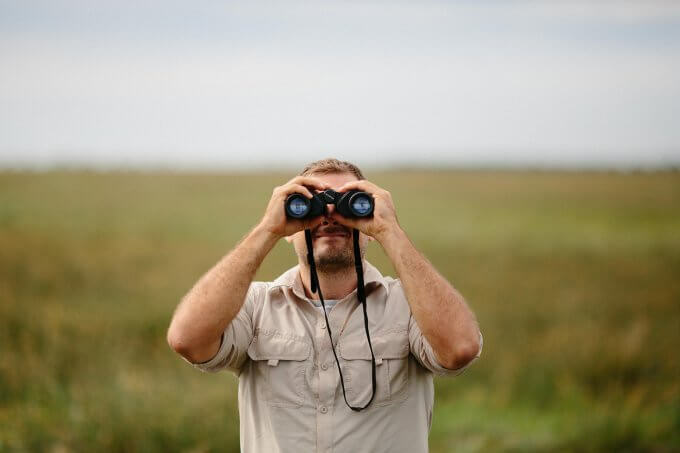 If you are winging it and don’t have any keywords in mind when diving into the domain name search, we suggest you give DomainHole a try. Built into the API is a Name Generator that will produce domain name suggestions based only on the user-selected name length. The names are usually pretty random but are pronounceable for the most part which could lead to exciting and unique ideas you hadn’t thought of before. Additionally, you can make use of DomainHole’s Name Spinner, which will automatically combine your new keyword with other English words chosen at random. You can also check for the soon-to-be-expired domain name by using your keyword as well. All in all, DomainHole is probably the most fun way to generate a domain name, and if you aren’t tied to any pre-existing keyword commitments, it’s not a bad place to start. Designed for three different levels of users, Domain Puzzler features three unique search modes that anyone can use. The first mode “Easy” is great to see if another user already takes your proposed domain name. The next level up, “Advanced” offers users the ability to combine their keyword with others. The third mode, “Magic” is where users can have Domain Puzzler automatically combine their keyword with another popular search term. This domain name generator is an excellent solution for all levels of users and is an excellent choice if you already have a domain extension in mind since you can filter your results by only selected extensions. Last but not least is a simple domain name tool that will reliably return dozens of domain names with every keyword search and will appropriately label them with available, make an offer, or the asking price. This makes tracking down and buying existing domain names much simpler. Also, with the advanced domain name search tools, you can modify your search results to display domain names with particular extensions, languages, prefixes and suffixes, availability, etc. This makes DomainsBot a powerful tool for anyone seeking a domain name, regardless of their experience or skill level. Domain names are bought, sold, created and registered every single second, and the Internet is an ever-expanding landscape of new websites with unique domains. The competition is tough, and most of the generic one-word domains were taken years ago, but there is still hope to either invent a new domain and buy an existing one. Domain name generators are invaluable tools when it comes to domain name research and securing the perfect one for your website. If your ideas are taken, don’t be disappointed. You’d be surprised how many domains are available that you hadn’t previously considered. Domain name generators will help you find them! Have you ever used any domain name generator? Which one is your favorite? Did you find a perfect domain? Please share your experience in the comment section below. Thanks for the useful list. We just launched https://www.mydomaingenerator.com , a domain generator tool which helps users to find the best domain name. I’d be happy if you include it to your list. I’ve not really gotten over my last experience with domain name generators and I’ll need a lot more convincing before I’ll comfortably go back to them. The last time I used the tool to get name suggestions, I got an amazing idea. Before I could get back to my team to tell them the new development, the site owner bought the domain and wanted to sell it back to me at a very high price. It was really painful. The good thing about namesmith domain name generator is that it doesn’t feed you with information and goes behind you to steal it for their gain. They are quite transparent and reliable and I’ve never regretted any search I’ve made using their tool. They give very good suggestions too and offer other cool services. I’ve used a lot of these domain names generator and the best so far is DomainBot. The site is great and very helpful. It allows you search through a large number of suggested names and at a point you might even forget the one you had in mind and go for a much better suggestion. Plus, they are good with suggesting keywords that can be used in posts on the site.